Nectarines need full sun to limit disease and produce high quality fruit. Top-dress generously with well-rotted organic matter in spring , along with a balanced organic fertiliser. Keep the area under nectarines mulched with wood chips or sawdust. Garlic and Tansy. Corridors within the orchard that are planted with clovers and other legumes contribute to soil fertility and attract pollinators. Prepare a large hole by breaking up the soil and adding plenty of well-rotted organic matter. A wide hole is better than a very deep one. Mulch after planting, and encircle the trunk with a wire cage or protective pipe to protect the young tree from animal and insect pests. Young nectarine trees are at high risk for damage from insects that bore into the main trunk. Nectarines are self-fertile, but produce better when more than one tree is grown. Prune nectarines hard in winter. Healthy nectarine trees will bear for twenty years or more. Pick when the colour has fully developed and the flesh feels soft near the stalk. The fruit should pull away easily from the tree. Keep plant dry under cover to avoid peach leaf curl. In humid climates, nectarines often develop problems with fungal diseases such as brown rot. 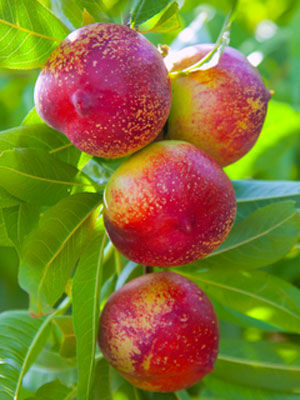 Preventive sprays with organic fungicides are often needed to grow good quality nectarines.